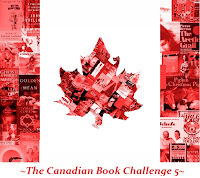 Here is my 4th Canadian re-read for the Canadian Book Challenge over at The Book Mine Set. Is it cheating that I've picked a YA novel this time around and finished it in under 24 hours? ork on the first page of each chapter. First Read: Probably not too long after it was published - I suspect that it was a birthday present from my parents either that year of the next. I read it in the summer time when I was probably 10 years old or so, and just truly falling in love with books and reading. I went camping for the week with one of my friends from Girl Guides and her family. I was the kid that always got homesick even if I was away for just one night, so I made sure that I packed books that I thought would keep me distracted. That week saw me read and fall in love not only with this book, but with another one of my life-long favourites, Emily of New Moon (by L. M. Montgomery). Original Impression: I fell in love with this book the first time I read it, and continued to re-read it regularly through the years. It fell out of frequent rotation when I started university, but I still come back to it on occasion. It was written as a follow-up to her better-known book The Root Cellar. I have read her other historical YA novels and love to see how the same families that she created keep popping up through history, but this book has always been my favourite of hers. Current Impression: I still love this book. The characters seem so real to me. The story is beautiful - a hit of mystery and the paranormal, a quiet romance, and very real human emotions throughout. It is historical fiction, which I loved reading when I was growing up, and still enjoy reading. The story is of Mairi, a 15-year old girl in the Scottish Highlands in 1815 with the Second Sight (interesting to note that Emily, the other heroine from that camping trip also has the Second Sight...), who hears her cousin and best friend calling her from Upper Canada, the other side of the ocean. Mairi leaves her family, and the land she loves, and the only life she knows to travel across that ocean, only to discover that her cousin has died and the rest of her family has left to travel back to Scotland. She is then faced with the dilemma of what to do and how to survive. Edward County (or "The County" for those of us from the area!). It is hard to imagine the open farm lands of today described as being "dark with forest." Mairi's journey west from Montreal towards Kingston is described as "giant pines rising a hundred feet and more into the air, their trunks over six feet across, their branches starting only thirty or forty feet from the ground and meeting high above the rough road." I guess those early settlers did their work well clearing the land, because no hints of that forest remain today. l caught myself tearing up at the end. This book will definitely stay in my re-reading rotation, any time I need an easy yet engaging read. Nicola - Me too, as you may have gathered from this review! I have the same edition; isn't it lovely! I was always more fond of The Root Cellar, but I think if I'd read this one first it would have gone the other way. BIP - I'm glad that someone else out there has that same edition to enjoy! If I had read The Root Cellar first, I might have been drawn to Rose more than Mairi, but as it is, I go back to this book much more frequently than The Root Cellar. I'm thinking of picking up another Canadian YA book from my childhood for my next read. Stay tuned! I bought the one with the other cover, it's so creepy! Wish I had this one instead. Medea - I'm so excited to learn that so many other people love Janet Lunn's books!